I have been reviewing for almost ten years now, and when people ask me who my favorite authors are, Jennifer McMahon is always at the top of my list. Her Island of Lost Girls was one of the very first books I featured here, and what I always say about it is this: don't make the mistake of taking it on vacation with you because you won't want to do anything else but read! 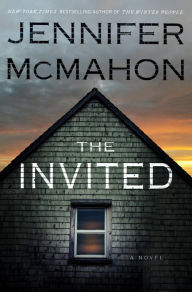 With The Invited, McMahon continues with that creepy, haunting vibe she does so well in her books. Helen and Nate decide to chuck it all and move from the comforts of their Connecticut home to rural Vermont. At first, everything is exciting to them: they buy a piece of land and begin building their beautiful new house. As the days pass, however, they discover the dark history of their land, which includes the hanging of a supposed witch, Hattie Breckinridge. Helen becomes consumed with learning everything there is to know about Hattie and her descendants. In her quest to use salvaged materials with history to design her new home, Helen also inadvertently builds her own haunted house. McMahon's use of short chapters makes The Invited positively addicting. Readers will be caught between a rock and a hard place: you won't want to know what happens next but you won't be able to stop reading. As far as I'm concerned, McMahon is the queen of the dark, creepy book.